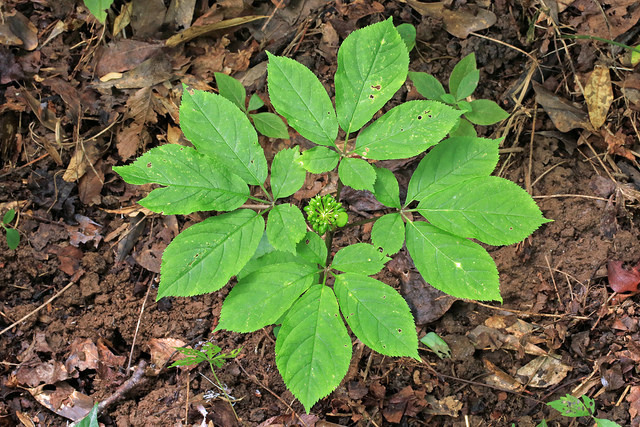 American ginseng is in decline thanks chiefly to range-wide overharvesting, according to new research led by University of Georgia ecologist John Paul Schmidt. But that trend could potentially be reversed by promoting and supporting ginseng cultivation. American ginseng grows in the deciduous forests of the Eastern and Midwestern United States. It has been harvested for trade since the 18th century, especially in the southern Appalachians and Ozarks, for use in herbal remedies. Considered a species of conservation concern in several states, its trade is regulated by the U.S. Fish and Wildlife Service under the Convention on International Trade in Endangered Species, or CITES. With the price of ginseng rising, U.S. Forest Service officials were concerned that ginseng could become threatened by increased demand. Schmidt and his colleagues developed models to help the Forest Service determine the status of ginseng across its range, as well as how environmental and socioeconomic factors influence its harvest and population sizes. Because ginseng populations are difficult to measure directly, Schmidt based population estimates on records of harvests kept as part of the requirements of CITES. “You can say harvests have increased or decreased and you can infer from that if the population has increased or decreased,” he said. Schmidt used information from a variety of sources. He compiled harvest records for 1978-2014 from 18 states where ginseng is found and county-level records for 2000-2014 to chart how ginseng numbers varied over time. He found that ginseng harvests appear to have declined in most states over the past 40 years. Schmidt created a species distribution model to determine where the best habitat for ginseng is, and then to establish what other factors had the greatest influence on ginseng harvests. He used U.S. Census data to see how poverty rates and other socioeconomic factors correlated with ginseng harvests, as well as the location of public lands in the areas with ginseng. Schmidt found that poverty rate was, after habitat suitability, the most significant factor in ginseng harvest. Generally, the higher the poverty rate, the greater amount of harvesting was reported. To the surprise of the researchers, the availability of public lands did not appear to have a significant influence on ginseng harvesting. The areas where ginseng thrives contain many national forests and parks as well as state-owned lands, and the U.S. Forest Service permits harvesting of ginseng in some, but not all, national forests. Schmidt cautioned that while the study estimated broad trends and their potential causes, more information is needed to make more specific claims. Information from ginseng collectors and dealers may not have been accurately reported. As such, numbers of wild ginseng may be lower in actuality as they may also include cultivated or “wild-simulated” grown roots; wild-harvested ginseng has a higher value than cultivated, but the two are almost impossible to differentiate. Illegal harvesting, by its very nature, cannot be easily assigned numbers of ginseng harvested. However, these missing numbers may be quite large and further increase the total amount of ginseng harvested each year. As both price and demand rises, harvest pressure on ginseng is likely to increase. Considering how little effect public land availability was found to have on harvest numbers, it is unlikely that further restrictions, such as banning all harvesting on public land, would relieve this pressure. Schmidt believes the best strategy to conserve and increase ginseng populations is to encourage the cultivation of ginseng over wild-harvesting. He likened it to agricultural extension programs in Georgia that support farmers growing blueberries. “There’s this whole federal and state infrastructure to support them and get them started, to give them loans to plant the [blueberries] and to wait however many years it takes for [those plants] to produce blueberries,” he said. “You could do the same thing in the mountains. The study, “Explaining harvests of wild-harvested herbaceous plants: American ginseng as a case study,” was published in Biological Conservation. Co-authors are Jennifer Cruse-Sanders, director of the State Botanical Garden of Georgia; Susana Ferreira of the UGA department of agricultural and applied economics; James Chamberlain of the U.S. Forest Service; and John Young of the U.S. Geological Survey. The study was funded by the Southeast Regional Office of the U.S. Forest Service.